PASSPORT The bed has been presented with particular notoriety at ORGATEC 2010’s issue by ACTIU, within its strategy to find global solutions for airport equipment. 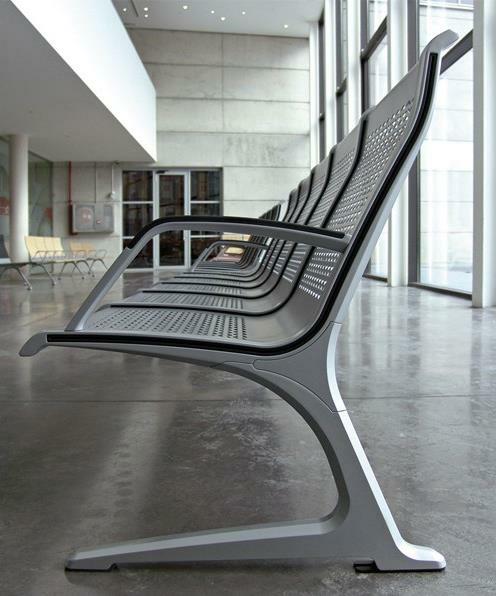 Designed by Javier Cuñado from ITEM DESARROLLO DE PRODUCTO, this bench is a concept that has an architecture that integrates all its elements. We made an effort to create something innovative, differentiated, with a high level of technology and design. This is a highly versatile, configurable and designed to offer the best solution to every installation environment inside a passenger terminal, airports, ferries, trains, buses, etc. We have paid attention to detail and simplicity of both, constructive solutions, and maintenance. Accessibility and cleaning have also been carefully addressed. PASSPORT offers a variety of configurations and finishes.We used high quality materials such as cast aluminum for the structure, polyurethane, plywood and sheet metal perforated for seat and back rests. It is one of the few benches that also offer accessibility solutions for handicapped people.